Driving back from another small adventure, tired and thirsty. Melbourne somewhere up ahead. Kind off staring my way through traffic, not really registering anything beyond the flow of things. 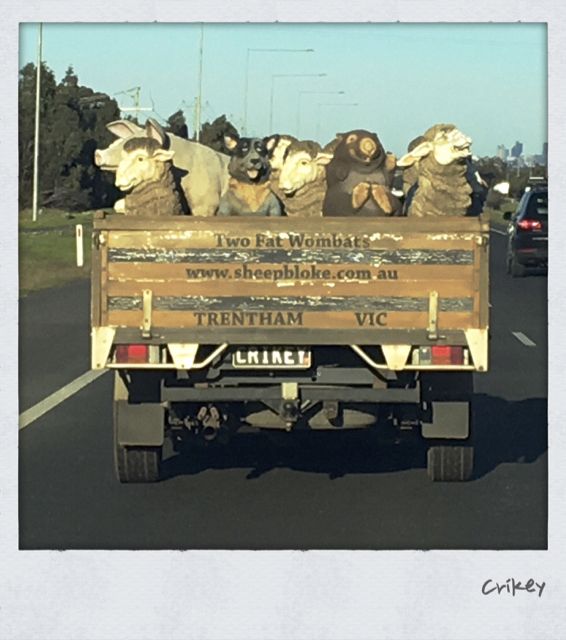 Until we slowly overtook this ute. Now let’s try to understand the story behind this. It was a Sunday, so perhaps the guy visited his old mother, who finally returned the things he played with as a kid. Or he has a special religion, where people worship animals. He just returned from mass. Or he was at a fair and couldn’t resist this bargain. He will run into the house and shout “Irene, Irene (his wife), come look what I found!” She shakes her head and looks up at the ceiling, trying to look beyond at some god that can explain this madness. The house is filled with toy animals. The elephant, life size, another bargain, stands in the middle of the living room. I really must look up that company: two fat wombats.